If you are working a changing shift pattern, getting a good sleep routine can be difficult to say the least. We know that working night shifts disrupts our natural body clock, known as your circadian rhythm, which regulates many of our physiological processes. This is affected by environmental cues such as sunlight and temperature, which if you are working a changing and/or night shift pattern, are altered from the the natural rhythm and may affect your health. Research* has shown that if you experience significant sleep loss, due working nights shifts for example, it may increase your risk of accidents at work, weight gain, type 2 diabetes and heart issues to name a few. 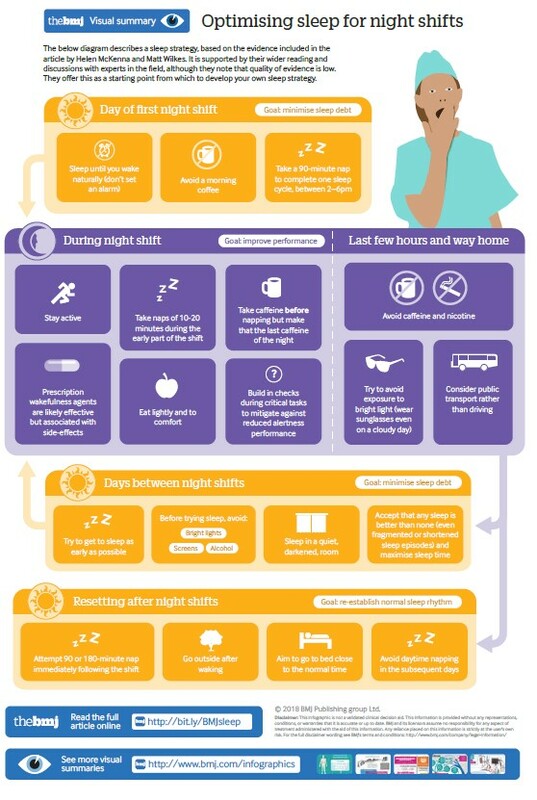 Based on the latest research* below you will find advice to optimise your sleep when working night shifts. Wake naturally, avoid a morning coffee and take a nap in the afternoon. Stay active during your shift, eat lightly and build in checks during your shift to make sure your critical tasks are not affected if you are feeling less alert. Try to avoid caffeinated drinks or smoking late into your shift or on your way home. Try to avoid sunlight by wearing sunglasses, even if its cloudy. Think twice about driving if tired. Opt for public transport if available. Try to get to sleep as early as possible and avoid sleep disruptions such as bright screens, alcohol – see also tips on improving sleep. Any sleep is better than none so don’t worry if it is broken sleep or short naps. Try and get a nap immediately following your night shift then go outside when you have woken up. To get back into normal rhythm go to bed as close to a normal time and avoid napping during the day.